Your Savannah cat may live with you longer than your children. With excellent care, your feline friend can easily live two decades—and maybe even longer. 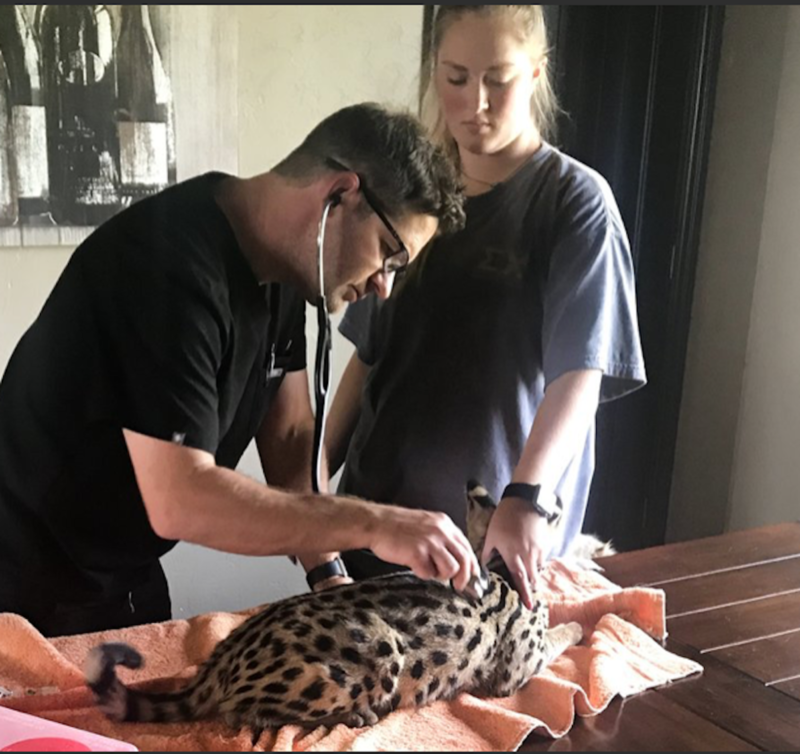 Like most cats, your Savannah cat will have a happier, longer life with excellent veterinary care. The right veterinarian can save you money, since preventative care can prevent costly illnesses from hurting your pet and dinging your wallet. Here’s what you need to know to protect your cat for a lifetime. Your vet is your partner, friend, and consultant. You need a veterinarian you trust, who listens to you, and who cares about your cat. Experience with, or at least knowledge about, Savannah cats. Consider asking your breeder for a referral. Affection for your cat. Your veterinarian should like your cat, and be genuinely interested in his or her well-being. A veterinarian who limits their practice size and who take lots of time with each patient is more likely to remember and care about your cat. Respect for your cat care philosophy. Do you prefer to take a “wait and see” approach, or do you want to quickly intervene when anything is wrong? Pick a veterinarian who can respect your cat parenting style. Knowledge of cat nutrition. Good Savannah cat health hinges on sound nutrition. Be wary of a veterinarian who pushes a certain food brand rather than talking about key ingredients. The best veterinarians are open to several different dietary options, and can provide advice on optimizing your pet’s diet. Excellent communication. Veterinarians that spend a lot of time with their patients sometimes take a little longer to get back to you. But if there’s an emergency, can you get in touch? Can you trust your veterinarian to answer questions? To be honest and direct? Fair and transparent pricing. Your cat is a member of your family, and we know you’re willing to pay to keep them healthy. That doesn’t mean you should be charged unfairly. Good veterinarians are honest about pricing, and can work with you on more affordable treatments when price is a concern. Access to a pharmacy. If you need a refill, can your veterinarian call in a prescription to the pet pharmacy? Or do you have to go into the office? Your kitten will need boosters a year later. It’s important to note that some feline diseases can be transmitted to humans. So vaccinating your kitten protects you and your family, as well as your cat. All cats need annual wellness visits. This gives your veterinarian a chance to evaluate your cat, answer health and behavior questions, and make recommendations about diet, exercise, and other key components of good cat health. Most vets order blood work at each annual exam. This test assesses for feline leukemia and feline immunodeficiency virus. The veterinarian may also check your cat’s thyroid, perform a complete blood count, and test your cat’s blood serum chemistry. Each of these tests can provide early flags for serious health problems. Depending on your cat’s health and lifestyle, the doctor may recommend other tests. For instance, a cat that may have been exposed to heartworms may need to be tested for the disease. Cats can host a number of parasites, such as fleas, roundworms, and hookworms. Not only can these parasites hurt your cat; many are also transmissible to humans. Deworming your kitten is the best way to prevent many common parasites. Your breeder may already have dewormed your kitten, so ask about this before worming your Savannah cat. Fleas can damage your cat’s skin, cause hair loss, and even spread diseases. Even indoor cats can get fleas. So consider a flea preventative treatment. The safest and most effective flea treatments are oral medications you get from your vet. Over the Counter collars and sprays can irritate your cat’s skin, trigger allergies in humans, and may not be as effective. Cats are less likely to get heartworms than dogs, especially if they remain indoors. But any cat who lives where mosquitoes reside can get heartworms—even if they are exclusively indoors. So ask your vet about an oral heartworm preventative treatment. Many cat owners struggle with knowing when to call the vet, and when to wait and see if symptoms get better. Fleas, mild stomach issues, and subtle changes in behavior are fine to treat at home. Observe for a few days, and if symptoms don’t improve, see the vet. As your cat’s breeder, we’re always happy to answer questions about their health, behavior, or diet. Give us a call if you need us. We care about your cat and your family! Click on the pictures or the hyperlink to see some of the products we recommend.